Barnabus and the penguins were sitting around the glowing boiler. A long night of work had just ended, and the penguins were ready to bed down for the day. However, before they went to bed, they waited for Barnabus to tell them a story. Penguins don’t write. It’s not that we don’t know how. It’s not that we can’t. It’s just that it is extremely difficult. Grasping a writing instrument in our wings is very difficult, and using our beaks to write can cause them to become dull. So, while many human cultures have preserved their history through writing. Penguins have had to keep history alive through stories. (It’s one of the reasons I tell you a story every morning just before bed. It keeps our history and culture alive and helps you to remember more than you realize.) There is magic in storytelling, there is magic in words. Obadiah always wore colorful clothes. That isn’t to say that clothes make the penguin. It’s just to point out that he was a little eccentric. Penguins don’t need clothes now, and they didn’t need them way back when. It’s true that some penguins like to dress up, and that’s okay. But Obadiah had a special reason for wearing the clothes he wore. He had a top hat that was more patches than hat. Each patch a different color, it perfectly matched his cloak, which was so colorful, the stories say it hurt to look at in the daytime. It certainly stood out against the snow-covered landscape of yesteryear. Obadiah would go from rookery to rookery. Keeping all penguins connected and helping everyone remember their history – if you don’t know where you come from, you can’t know where you are going. Obadiah’s stories were magical as were his words. Penguins would gather around and to hear him perform. But I could never do Obadiah justice, so this story isn’t about the stories he told and how he told them. 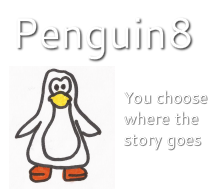 Instead, it is the story of how he saved all penguins from being wiped off the face of the planet. Penguins, by nature, were never really creatures that enjoyed staying in one place. We liked to migrate – just like all the other birds. We just couldn’t fly. So we walked North or South or East or West – always in our rookeries. This brought us into other penguin rookeries. It allowed us to keep our bloodlines diverse. Obadiah had traveled to one of the farthest North enclaves and found a group of penguins who could no longer be called a rookery. They were scared and far too few in number. Their leader had died, and only the young were left. They clamored around Obadiah and looked to him for help. Obadiah told them a story to help calm them, and then he went to find the creature that had devastated the rookery. He knew that other penguins were coming north, and he needed to assess the threat and mitigate it if possible. Obadiah took the eldest of the penguins with him and told the others to wait for them. The 2 penguins went out and a little farther north. The younger penguin pointed to a place just beyond the icy ridge. They snuck to the top, Obadiah removed his hat and peered over the ridge. There he saw one of the largest animals he had ever seen. It was white like the landscape, and it was feasting on a bloody carcass. A shiver ran down Obadiah’s spine and not because he was cold. He rolled back behind the hill and took a deep breath. Obadiah let out a sigh. It would probably be best to wait for that bear… It was the closest word he had for the creature… to stop eating. The only chance the penguins had to survive against that thing was to be where it wasn’t. That meant negotiating a treaty. He just hoped that they were all bound together through some sort of governing group or person. He looked over the ridge again. The bear was sitting in the snow looking bloated and sleepy. Now was the time… He nipped over the ridge leaving his companion to watch and recount the story and warn the others if Obadiah failed. Obadiah slid down the hill and came to rest in front of the bear. He got up slowly and stood at his full height. “Hello! I’m Obadiah.” He said in his friendliest voice, one that conveyed the beginning of a story. The bear looked at him dumbly and stood up on its hind legs. Obadiah was small in comparison, very small. The bear roared down at the Obadiah – a roar that ended in a burp. The smell washed over Obadiah and he turned slightly green. While I can’t do the story justice, I can tell you that it was about a giant that ate the little animals of the world. One day, the giant ran into a group of creatures it had never seen, but since they were tiny, the giant popped them into his mouth, chewed a little and swallowed them down. The giant didn’t catch them all. Those that escaped cowered in fear and waited for the giant to find them. Fortunately for the little animals, a champion arrived, went to the giant and with his words won a boon. The giant said he would show mercy and the rest of the little creatures could go. If the creatures ever returned to the giant’s territory, however, they would be fair game. The little creatures agreed, and they never saw the giant again. The story was so well told that the bear had tears in its eyes when it was over. While the bear may have looked dumb, he understood what Obadiah was saying, and like the giant he showed mercy to the rest of the rookeries. Striking the same deal, he and his kind would stay to the North. The penguins were free to go to the South. “That is why we and the polar bears have never lived in the same place,” said Barnabus. “For with their voracious appetites and endless wanderings, the polar bears would have surely eaten every last one of us. With the warning and a bit of hope, Barnabus sent everyone to bed. The penguins all hid for the sun was just about to rise, and they had another night of work to look forward to. Get your own penguin at Penguin Emporium.